All transactions are safe and secure with a reliable history in online purchasing behind each of our associates. Buy the I am McLovin, the 25-year-old Hawaiian Organ Donor t-shirt to own Superbad clothing and merchandise. The front of the retro style tee shown on the left displays Fogell's "I am McLovin" quote from Superbad. The yellow design on the green T provides a retro style effect akin to video games from the late nineteen seventies. Three yellow bars that fade out down the chest of the tee underline the yellow text. Underneath the bars is the tagline, "the twenty-five year old Hawaiian organ donor." 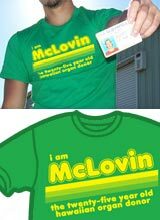 This I am McLovin t-shirt is available in both men's and women's styles in a variety of sizes. In addition to the I am McLovin, the 25-year-old Hawaiian Organ Donor tee above, browse the Superbad Clothing Gallery for more apparel like men's and women's clothes, kids shirts or hoodies.